Renowned English mountaineer George Mallory participated in the early 20th-century attempts by British climbers to reach the summit of Mount Everest, the highest mountain in the world. It is possible that he and his climbing partner, Sandy Irvine, were the first people to reach the summit. However, because they died in the attempt, whether or not they succeeded remains a mystery. George Mallory was born on June 18, 1886, in Mobberley, Cheshire, England, the son of a wealthy clergyman who was also a lord. Mallory and his brother and two sisters led a free, undisciplined life in their rural village, where they spent much of their time out of doors; years later, according to P. L. Firstbrook in Lost on Everest, Mallory's sister Victoria would recall: "It was always fun doing things with George. He had the knack of making things exciting and often rather dangerous. He climbed everything that it was at all possible to climb. I learnt very early that it was fatal to tell him that any tree was impossible for him to get up." Once, when Mallory was sent to his room for misbehaving, he disappeared. Later, he was found on the roof of the Mobberley Parish Church. He protested that he had followed orders and gone to his room to get his hat before climbing out. When he was eight or nine years old, Mallory became curious about what it would feel like to be on an island, stranded by the tide. When he and his family visited the seashore, he climbed up on a big rock when the water was at low tide and waited for the tide to come in. However, young Mallory had no idea that the entire rock would soon be underwater; when the tide came in and water covered the rock, he had to be rescued. Although his grandmother was deeply upset by this incident, Mallory remained unbothered. In another instance from his childhood, Mallory told his sister that a person could lie down on the train tracks and let a train pass over. Although he never actually tried such a stunt, he frequently climbed poles, roofs, and anything else he could find. According to Firstbrook, Mallory's friend David Pye wrote, "There is no doubt that all his life he enjoyed taking risks, or perhaps it would be fairer to say doing things with a small margin of safety." At the age of 14 Mallory won a scholarship to Winchester College. He loved the school, and his interest in climbing was fueled by the fact that his headmaster, Graham Irving, was an experienced mountain climber. With Mallory and some other students, Irving formed the Winchester Ice Club, a climbing group. Irving was an experienced but controversial climber who advocated climbing without local guides and who often climbed alone, both considered irresponsible at the time. In 1904, when Mallory was 18, the group went to the Alps and attempted to climb Bourg St-Pierre, a relatively modest mountain of under 12,000 feet. Despite its modesty, the mountain proved more than enough for the young climbers. Mallory and another boy developed mountain sickness 600 feet from the summit, forcing them to retreat. Mallory later returned with Irving and succeeded in two summit climbs. At this point he was hooked, and spent the following summer in the Alps. Away from mountains, he climbed the roof of his family's house, towers, and church steeples, occasionally getting into trouble for these exploits. Mallory attended Magdalene College, Cambridge, where he was not particularly happy as a freshman. During his second year he made more friends, including Charles Darwin's grandson (also named Charles), the poet Rupert Brooke, zoologist A. E. Shipley, and economist Maynard Keynes. Although he was interested in his studies, Mallory often failed to hand in his work on time, and cared little when he tested poorly on his exams. He spent his vacations from school climbing in the Lake District of England. In his third and fourth years at school Mallory's academic performance improved. In 1909 he met Geoffrey Winthrop Young, an experienced climber who would become a lifelong friend. Young introduced Mallory to other great climbers of the day, including Percy Farrar, who would later ask Mallory to be a part of the first Everest expedition. Mallory was still not sure what he wanted to do with his life; he considered, and rejected, the ideas of becoming a writer, a clergyman, or a mathematics teacher. Eventually, under pressure by his father to get a job, he took a position as assistant master at Charterhouse, where he was conscientious but often troubled because he was not much older than the students and he was not particularly authoritative. His students were often bewildered by the fact that Mallory wanted to treat them as equals, a method almost unheard of in the authoritarian schools of the time. He often took students on climbing trips that led to lifelong friendships. On July 29, 1914, Mallory married Ruth Turner, the daughter of an architect. The couple had a daughter, Frances, the following year. In 1916, during World War I, he spent a few months as a second lieutenant in the Royal Garrison Artillery, but was sent home when an old ankle fracture began bothering him. He and Ruth had another daughter in 1917, and a son in 1918. Although he had only spent a short time on the front, his war experiences shook Mallory and made him reassess his life. What was truly important? What did he truly want to do with his life? Although happy with his family, he still felt restless and unsatisfied. When, in 1921, Percy Farrar asked him to be part of the first Everest expedition in 1922, he eagerly accepted. The Everest expedition of 1922 did not succeed. The team spent weeks reconnoitering the mountain and debating possible routes to the summit. Mallory eventually mapped a route to the summit from the northeast. The climbers attempted to reach the summit, but had not traveled far before horrendous weather forced them to retreat. Overall, the expedition was unprepared and poorly equipped. As quoted by Jochen Hemmler, Larry A. Johnson, and Eric R. Simonson in their Ghosts of Everest,, Mallory later wrote, "I doubt if any big mountain venture has ever been made with a smaller margin of strength." Three more attempts to scale Everest in the next year also failed because of exhaustion, illness, equipment failure, and avalanche. Their first few failures left the explorers undaunted. On June 6, 1924, Mallory and climber Andrew Irvine emerged from their tent at Camp IV on the 13,280-foot-high North Col of Everest, ready to make another attempt on the summit. They had spent two months walking from Darjeeling, India, to reach this spot. Other members of their expedition were camped nearby: Colonel Edward Felix Norton lay in his tent, suffering from snow blindness, and Noel Ewart Odell and John de Vere Hazard had made breakfast of fried sardines, biscuits, tea, and hot chocolate. They had already tried twice to attempt the summit, but had failed. Now they were running out of supplies. Many of their porters had become sick, and now time was running out. Any day now—or any hour—the snow season would begin, burying the mountain in fierce storms. Mallory and Irvine determined to make one last summit attempt. Because of its high altitude, the air on Everest is too thin to provide enough oxygen. Mallory and Irvine put on their heavy, cumbersome oxygen apparatus. Accompanied by eight Tibetan porters carrying provisions, blankets, and extra oxygen cylinders, they set out toward the higher Camp V. Eight hours later, four porters returned with a note from Mallory stating that the weather was good and he was hopeful. Their next goal, Camp VI, was only 2,000 feet below the summit. Despite this seemingly short distance, the way was not easy. It included a steep climb up crumbly limestone, a nearly vertical 100-foot wall known as the First Step, a dangerously exposed walk along a ridge, another 100-foot wall, and finally a broad plateau leading up to the actual summit. Even if they did reach the summit, the climbers' ordeal would not be over. Descending through this terrain would be even more dangerous, because by then they would be extremely exhausted from the ascent. Mallory and Irvine set out from Camp VI the next morning. Odell, who had accompanied them, remained behind to explore the geology of the mountain near Camp VI and noticed a change in the weather: a midmorning mist was forming and beginning to cover the western face of the mountain. At the time, he thought the mist was only on the lower half of Everest, and that Mallory and Irvine probably had clear weather where they were. At 12:50, his forecast was confirmed when the whole mountain cleared, and he actually saw Mallory and Irvine, tiny black specks at that distance, moving slowly up the summit ridge. "Then the whole fascinating vision vanished, enveloped in cloud once more," he wrote, according to Hemmler, Johnson, and Simonson. Odell believed that the men were only three hours from the summit, and he hurried to Camp IV to get it ready for their return after they reached the summit. Just as he reached the camp, a snow squall blew in. Odell became concerned that Mallory and Irvine would have a hard time finding Camp VI in the snow. He climbed up the ridge shouting and whistling to guide them in. Realizing it was far too early to be expecting them, he returned to Camp VI. Now the weather suddenly cleared. As Mallory had instructed him the day before, once Odell had tidied Camp VI and supplied it with a compass and some extra food, he descended to Camp IV. Hazard was there, and the two men waited for their fellow climbers. They waited in vain, as Mallory and Irvine never returned. Odell and Hazard remained optimistic, thinking their friends had spent the night at one of the higher camps as they saw no fires or distress flares. In the morning they scanned the mountain with binoculars but saw nothing. At noon Odell and two porters began climbing up, despite the fact that Odell was exhausted. Camp V was untouched, just as Odell had left it two days before. The next morning, when the porters refused to climb higher, Odell climbed alone to Camp VI, carrying extra oxygen. Camp VI, like Camp V, was unchanged. He then climbed upward for two hours, but found no trace of the men, so he returned to Camp VI, where he laid out Mallory and Irvine's sleeping bags on the snow, a signal to Hazard that he had not found anyone. Then he climbed back toward Hazard. As Odell descended, he scanned the summit. He later wrote, according to Hemmler, Johnson, and Simonson, that "It seemed to look down with cold indifference on me, mere puny man, and howl derision in wind-gusts at my petition to yield up its secret—the mystery of my friends." On June 21, 1924, the London Times published the story: "Mallory and Irvine Killed on Last Attempt." 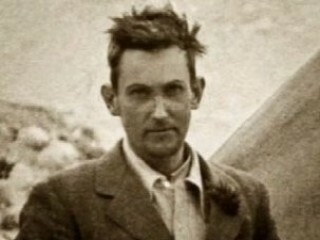 View the full website biography of George Mallory.